Thinking about my upcoming cross-country/cross-continent move has started a fire under me to get some of my old WIPs finished off once and for all. I'm starting with my Carnival Quilt top. I've started basting it and hope to get it finished soon!! This week I'm off on vacation, soaking up some sunshine and sitting in the sand. But before I headed south, a took a few snap shots to show you how I'm traveling homemade. In my carry-on (clockwise from lower left): I'm packing my Amy Butler Birdie Sling Bag with my Kobo Mini and cover, my iPad and case, our llama passport wallet and a knitting project bag. 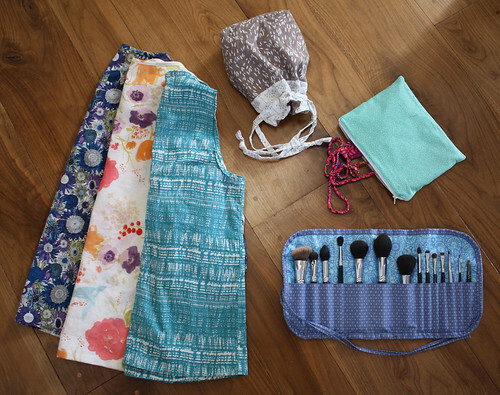 In my luggage (clockwise from left): three recent homemade wearables (reveals coming soon), a lingerie bag for delicates, a bikini bag (another reveal soon) and a pretty little make-up brush roll. 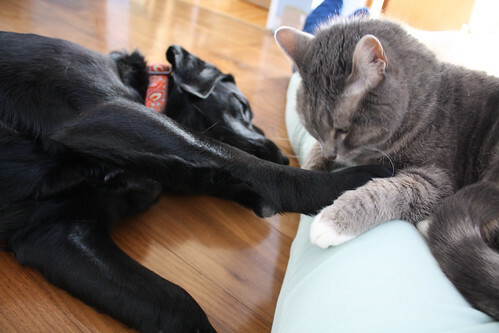 Something about these photos make my heart happy. So much homemade goodness! I recently purchased some laminated cotton and wanted to test it out on a simple project to see how I liked it. 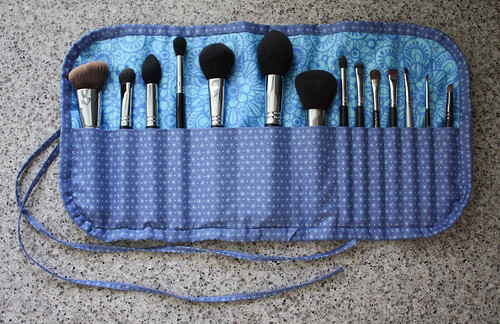 While browsing through a ton of great ideas over on Pinterest, I decided a make-up brush roll seemed like the perfect first project. 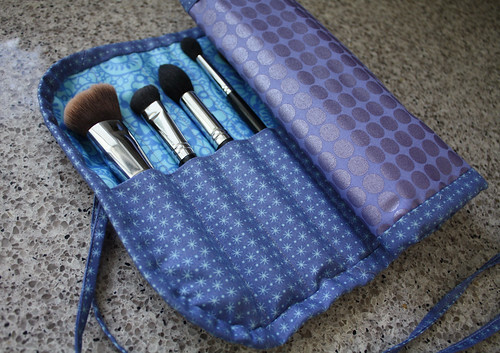 The laminated cotton I used behind the brushes is Honey Violet from Kate Spain's Honey Honey line. 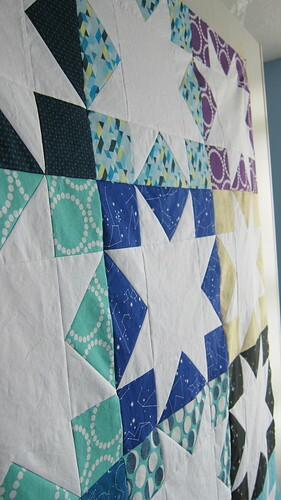 For the pocket and binding, I used Asterisk in Purple from Lizzie House's Constellation line. I don't know how she does it, but this fabric seriously shimmers, I only wish the photos did it justice. 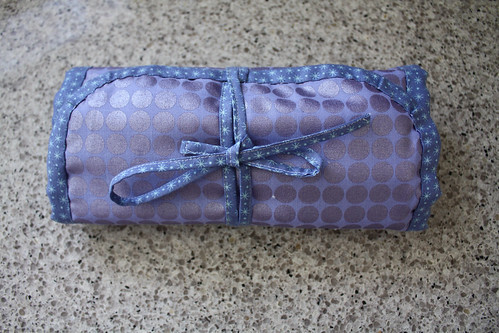 For the outside fabric, I used is Mirror Ball Dot by Mark Hordyseynski for Michael Miller Fabrics. I love that the sheen on this print gives off a glamourous vibe. It seemed very fitting for this specific project. I can't wait to take this on my next vacation! 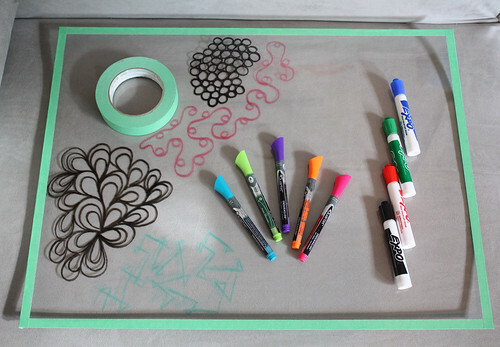 If you're interested in making your own version, check out the tutorial that I followed here for more details. 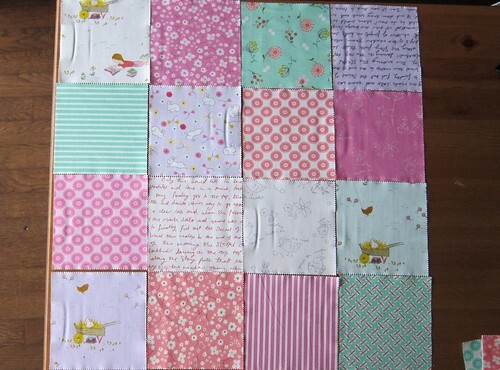 I spent most of the weekend working away on my Posy baby quilt. I managed to finish the top and then got it basted and quilted. 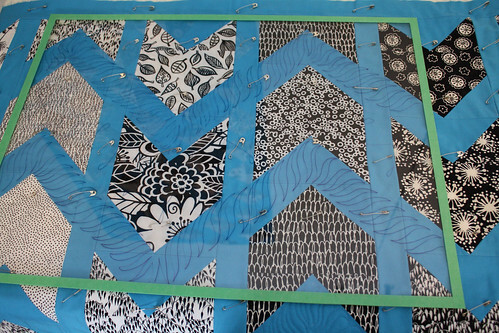 The only thing left is to tack the binding down. 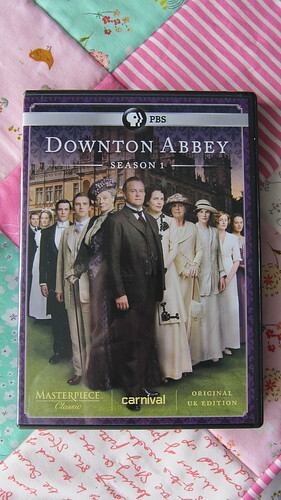 While I normally find sewing down bindings to be long and tedious work, I am pretty confident that this will help spur me along. I can't wait to get home tonight. It's going to be awesome! One of the more ambitious items on my most recent Hit List was to knit myself a pair of socks. The last and only thing I've ever knit was a scarf nearly a decade ago, but after being inspired by all the quilty blogs who have been posting knitwear, I decided it was high time to jump in. Here is my very first attempt at socks. It's not much, just a fairly basic stocking stitch but I knit it in the round, and to me, that's a huge achievement. 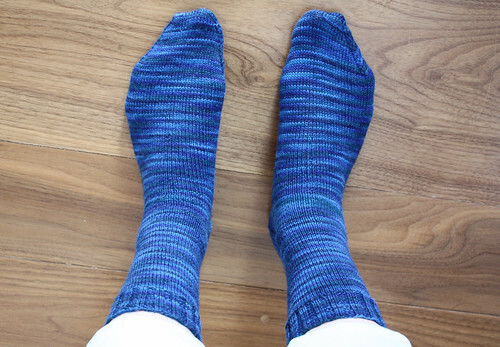 This was definitely a great project to get me excited about knitting, and I started a second pair of socks about ten minutes after finishing up this set. The next pair is quite a bit more challenging and I'm so pleased with how they're knitting up. I'm hoping for a reveal after a couple more weeks of train commutes so I'll keep you posted. 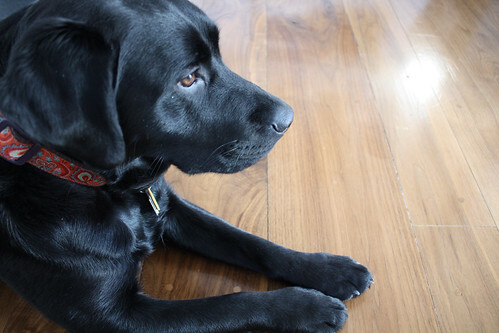 Good thing they're so cute because they sure aren't conducive to floor based photo shoots! The last few months have been crazy. Work has been really busy with 10-14 hour days being the norm and I have spent at least some time at the airport almost every week since December. 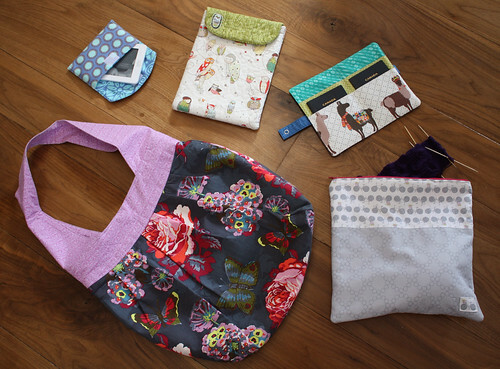 Suffice to say that this hasn't left much time for "home" things and I have missed my sewing machine dearly. I decided that the only solution was to overcompensate by blocking off an entire weekend where my only plan would be to spend quality time relaxing at home (where relaxing at home is code for crafting). 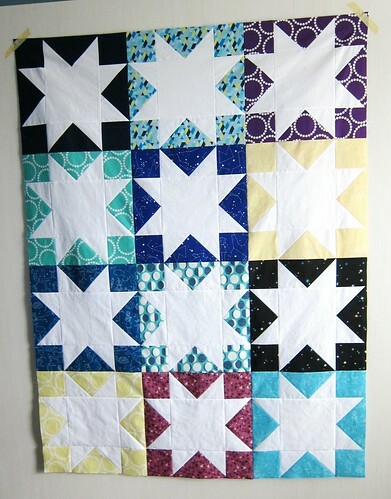 With all the extra time on my hands, I actually managed to finish up my White Star quilt top. I love the way it turned out. It is exactly the sparkly, twinkly project that I hoped it would be. 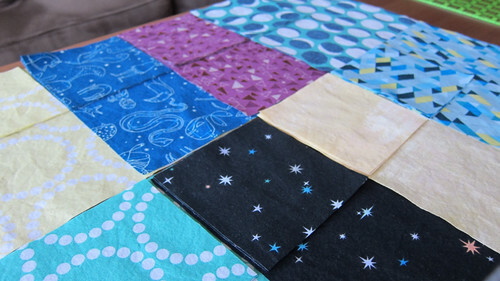 That Constellation fabric does amazing things to quilts. 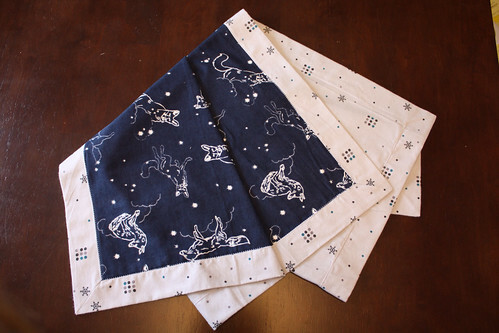 I think my favourite print is the indigo coloured constellation print. I love that Lizzy incorporated illustrations from her earlier fabric collections into this one. All of her critters are so charming but I might have been guilty of a bit of favouritism towards the starry squirrel. This top brings my number of unbasted quilt tops to three. 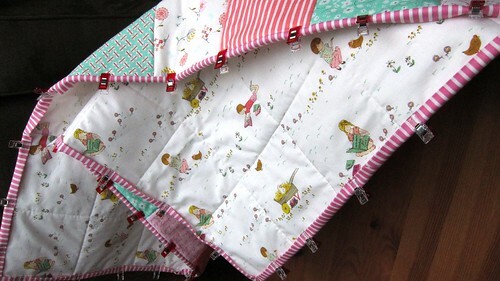 I also have two basted quilts that are waiting to be quilted. I am really hoping to get a few of these finished in the coming months. 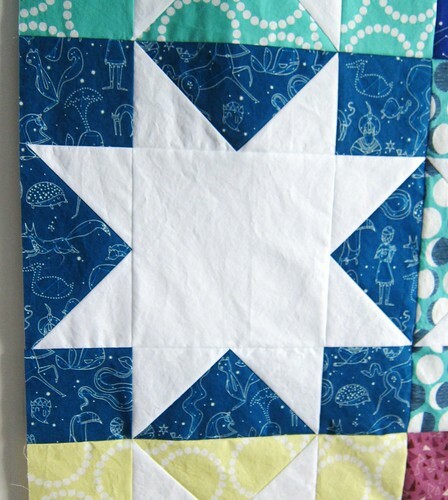 My white star quilt is progressing well. I'm really liking how this is coming together. I should finish off the rest of the blocks later today. 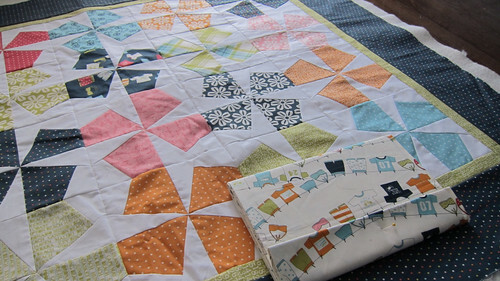 Up next, a finished quilt top! 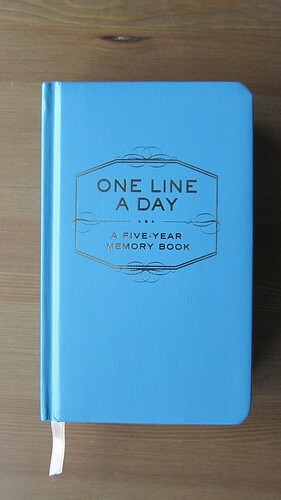 After seeing a number of five-year diaries on various blogs, I decided that it was time to start one of my own. A lot has changed in my life over the course of the past five years and I expect that the next five years will be just as full of new and exciting experiences and challenges. It seems like the perfect time to make a daily record of the important things in my life. Although I have just gotten started, I am really enjoying the five minutes I spend each evening reflecting on my day and putting together a sentence or two that captures it. 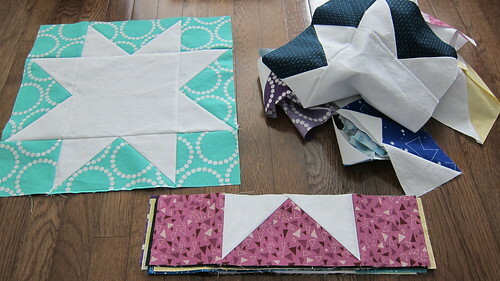 I also started another new quilting project in honour of my work colleague's recent announcement that she and her husband are expecting a baby girl in early July. My co-worker keeps mentioning that she is planning to use white, lavender, pink and minty green in her nursery. I was having a hard time envisioning the palette until I saw that Aneela Hoey's new Posy collection used hat exact combination of colours. I love how sweet and cheerful the prints in this collection are. 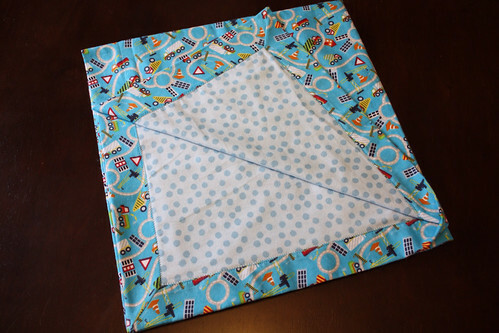 There is enough variety and interest that I am planning to just sew all of my charm squares into a baby sized quilt to let the fabric shine. Nothing fancy, no extra fabrics and no crazy patchwork. Easy and satisfying. I spent part of my morning working on possible layouts. 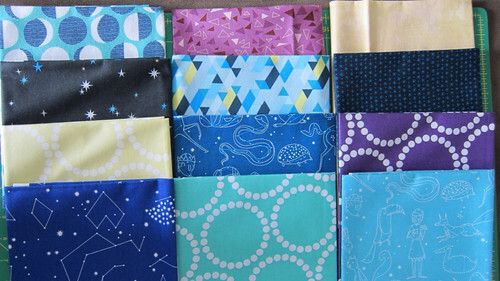 These bright fabrics have definitely softened the blow of the snow that fell earlier today. Nothing seems cozier than flannelette in the winter, and judging by todays weather, the chilly temperatures might be sticking around. 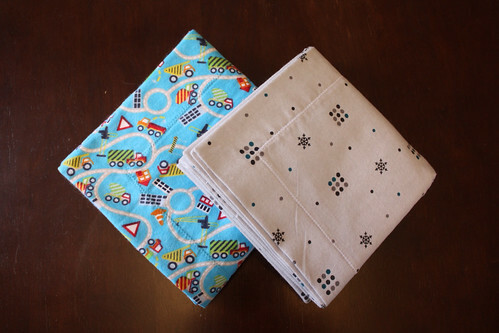 I followed a fantastic tutorial by Apostrophy Designs to whip up two Perfect Corner Baby Blankets. I've likely made about a dozen of these over the past year and I'm sure I'll make dozens more in the future. 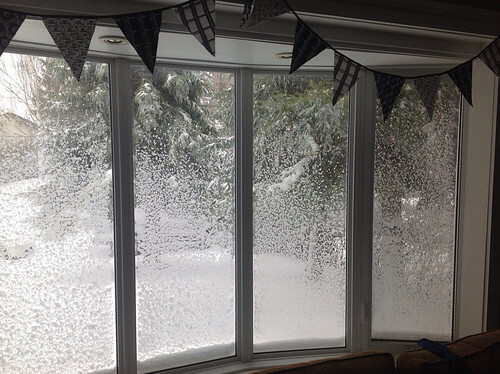 To be honest I stocked up on flannelette specifically with these blankets in mind. The tutorial is great and I would highly recommend it to anyone. I generally make at least two in a sitting and it doesn't take more than an hour a piece (though fancy stitching can add significant time so be warned). I love showing up back home with lots of home made gifts and kidlet hugs in return. I think my cousin's sweet little boys will love these. Just home from an amazing week in Panama with one of my childhood friends, I wasn't quite ready to forget the relaxing days on the beach and head back into the fray of regular life at home. The trip was a celebration of my friend's upcoming 30th birthday and I decided on the flight home that I wanted to make a quilt for my friend that would remind her of this birthday vacation for years to come. One of the most memorable parts of our trip was the time we spent on the beach each night talking and looking at the stars. 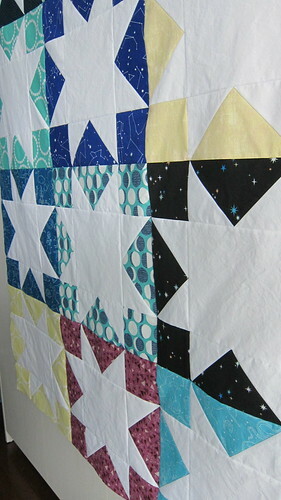 A starry quilt made from starry fabric seemed like the perfect thing. 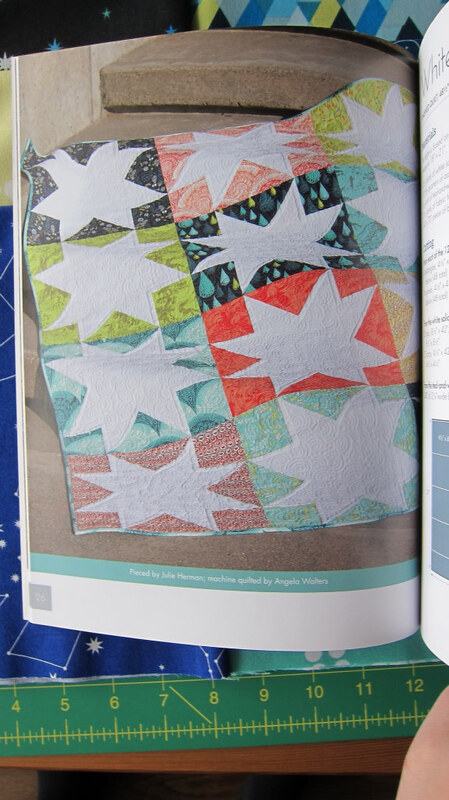 Enter Julie Herman's White Star quilt and Lizzy House's Constellations collection. I also added in a few other prints from my stash to add a bit of contrast. 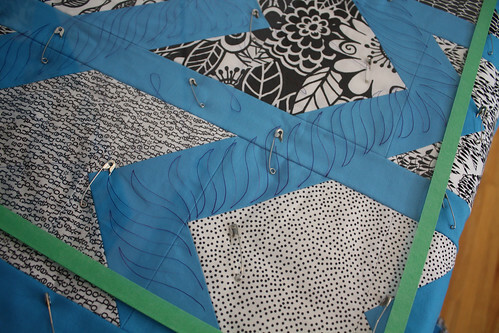 I've only just started cutting out my fabrics but I am really excited to see this one come together. 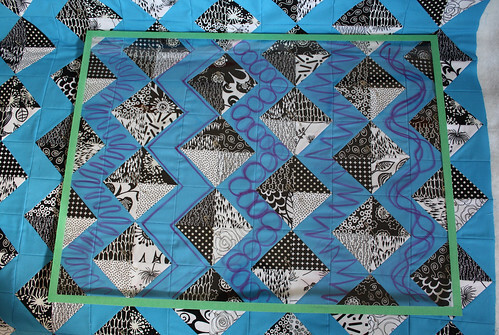 Since there are only 12 blocks in this quilt top, I think it might actually be a quick finish. Here's hoping I can finish up the cutting this weekend and find at least a bit of time to reacquaint myself with my sewing machine sometime later this week.